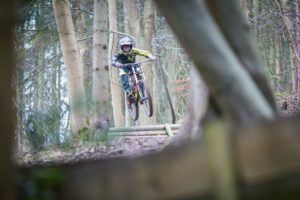 Firecrest Mountain Biking’s Young Rider Development Programme’s (DeVo) runs Mountain Bike Skills Courses for riders from 8 years to 18 years of age. 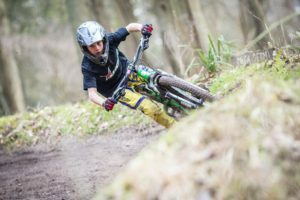 DeVo focusses on having fun and developing the Mountain Bike Skills Essentials to get the most from your Mountain Bike. The programme works on three Levels, DeVo1 is the Introduction to Mountain Biking for riders aged from 8 years to 12 years, DeVo Evo is the progression for those riders looking to take their skills a bit further and DeVo2 for riders from 12 years to 18 years enables riders to progress their skills and move onto specialising in the specific disciplines of Mountain Biking. DeVo is run by Firecrest Mountain Biking at Aston Hill Bikepark. The courses are run during the School Holiday’s with DeVo Level2 Courses on alternate Saturdays from September to March with selected Saturday Morning Courses from April to September. The DeVo Courses range is cost from £12.00* per participant for the DeVo1 Holiday Courses through to £30.00* per participant for the all day DeVo2 Holiday Courses. The DeVo1 Courses are for Mountain Bikers aged from 8 years to 12 years old looking to develop their Mountain Bike Skills. They will get you riding your Mountain Bike with more confidence. They are a great opportunity to meet likeminded young riders and progress your riding and get out and experience the trails on Aston Hill. The perfect introduction for young mountain bikers coming through our programme of Mountain Bike Skills Courses. Firecrest MTB’s DeVo Level1 Mountain Bike Skills Courses provide a great introduction to the Mountain Bike Trails on Aston Hill from the, Bomb Holes to the Pumptrack and a taster of the Cross Country and Downhill Trails. Please Note: – This Courses is for Mountain Bikers aged from 8 years to 12 years old who have attended 4 or more Level1 DeVo Courses or have been adivsed by Ian to book on this course and are looking to progress their skills. The Holiday Mountain Bike Skills Courses at Aston Hill Bikepark will get you riding your Mountain Bike with more confidence. They are a great opportunity to meet likeminded young riders and progress your riding and get out and experience the trails on Aston Hill. The DeVo2 Mountain Bike Skills Courses at Aston Hill Bikepark will get you riding your Mountain Bike with more confidence and speed. They are a great opportunity to meet likeminded young riders and progress your riding. From getting faster on the trails on Aston Hill through to racing at Local, Regional and National Competitions. Firecrest’s Mountain Bike Skills Courses are structured to provide a progressive programme of Mountain Bike Skills Training so you can come on them all or just come along on the days you can make to suit. * All Prices subject to EventBrite Booking Fee.